Biosensors are genetically encoded proteins or nucleic acids that enable cells to sense and respond to stimuli. They can be used to control gene expression, to construct genetic circuits, and to detect metabolic products for genome engineering. Many bacterial biosensors are based on natural allosteric transcriptional repressors, which after binding ligand, no longer repress a reporter gene and result in increased gene expression. Engineering allosteric transcription factors to bind new ligands is challenging, however, because engineered transcription factors often have broken allostery. One general strategy to new biosensors relies upon ligand-dependent protein stabilization. In this biosensor design, a protein that binds to ligand is destabilized with mutations, such that it is rapidly degraded in the absence of ligand, but stabilized in the presence of ligand (Figure 1A). We constructed new E. coli transcriptional biosensors based on ligand-dependent stabilization by fusing the LacI ligand-binding domain between the Zif268 DNA-binding domain and the RpoZ transcription-activating domain. We generated an error-prone PCR library of LacI ligand-binding domains between Zif268 and RpoZ, and subjected this library to a positive selection for growth with ligand (Figure 1B). The biosensor was coupled to the selectable marker HIS3, which was required for growth in the absence of histidine. Variants that survived selection were replica plated on minimal media with and without IPTG ligand, and variants that grew better with ligand compared to without ligand were selected for further analysis. Figure 1. A. Design of biosensors based on ligand-dependent stabilization. The LacI LBD is fused between the Zif268 DBD and RpoZ TAD and destabilized, such that in the absence of ligand, the biosensor is degraded, but in the presence of ligand, the biosensor is stabilized by binding ligand. This biosensor is coupled to a HIS3 reporter gene downstream of a Zif268 binding site. B. Selection strategy to identify new biosensors. An error-prone PCR library of LBD variants is subjected to positive selection with ligand in minimal media lacking histidine, such that only variants able to activate HIS3 expression grow. Biosensors that show ligand-dependent stabilization are subsequently identified by replica plating on minimal media with and without ligand. We identified a biosensor, L1.0, that shows ligand-dependent expression of HIS3, assessed by increased growth in media lacking histidine (Fig. 2A). It contains six amino acid mutations in the LacI region (Fig. 2B). To determine which amino acid mutations are required for biosensor behavior, we reverted each mutation back to the WT amino acid identity. All amino acid revertants except one, G272R, showed activity similar to L1.0, while reverting G272R abolished biosensor activity (Fig. 2C). We assessed biosensor activity with LacI G272R (named L1.7), and found that it showed a similar ligand-dependent response as L1.0 (Fig. 2D), establishing that a single amino acid mutation is sufficient to confer biosensor behavior. Finally, we confirmed that L1.7 was functioning by ligand-dependent stabilization using Western Blot. We observed an approximately 5-fold increase in the level of L1.7 with 100 mM IPTG compared to without IPTG, verifying increased stability, and therefore increased accumulation, that is dependent on ligand. Figure 2. A. Response of L1.0 and L1.0 without RpoZ at increasing IPTG concentration in minimal media. B. Amino acid mutations present in each LacI-based biosensor. C. Response of L1.1-L1.6, relative to L1.0, when induced with 100 mM IPTG. D. Response of biosensor L1.7 at increasing IPTG concentration in minimal media. E. Ligand-dependent accumulation of L1.7 as assessed by Western blot. Antibiotic resistance is a serious and growing problem. In 2013, the U.S. Centers for Disease Control reported that antibiotic resistance is responsible for more than 23,000 deaths and 2 million infections each year, costing approximately $20 billion. The problem of increasing antibiotic resistance is compounded by the small number of new antibiotics approved by the FDA in the past decade and a dearth of new antibiotic drug candidates in clinical trials. One rich source of antibiotic lead compounds is natural products, but isolation of new natural products has slowed, significantly hampered by the rediscovery of known compounds. If the biosynthetic pathways that synthesize therapeutically useful natural products can be efficiently engineered in a laboratory, then new, natural product-like compounds would be accessible. Polyketides are a class of natural products from which many important antibiotic compounds have been identified, including erythromycin, azithromycin, and clarithromycin. Polyketides are biosynthesized by polyketide synthase (PKS) enzymes, which consist of several modular protein domains that iteratively add small extender substrates together. One of the most well-studied polyketide biosynthetic pathways produces the antibiotic erythromycin A (Figure 1). It consists of three synthases, named DEBS1-3. 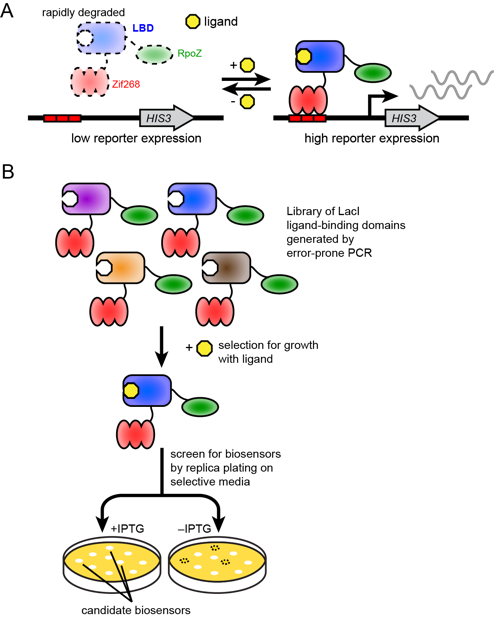 The synthases contains two modules, each of which incorporates a single extender substrate. A thioesterase domain on DEBS3 cyclizes the polyketide to form 6-deoxyerythronolide B, and additional tailoring enzymes convert 6-deoxyerythronolide B (6-dEB) to erythromycin A. Figure 1. Biosynthesis of erythromycin by DEBS1-3. 6-dEB is modified by additional tailoring enzymes to generate the natural product antibiotic erythromycin A. Because of the iterative manner by which polyketides are built and the modular nature of the PKS enzymes, engineering the biosynthetic pathways to produce new compounds is an appealing prospect. 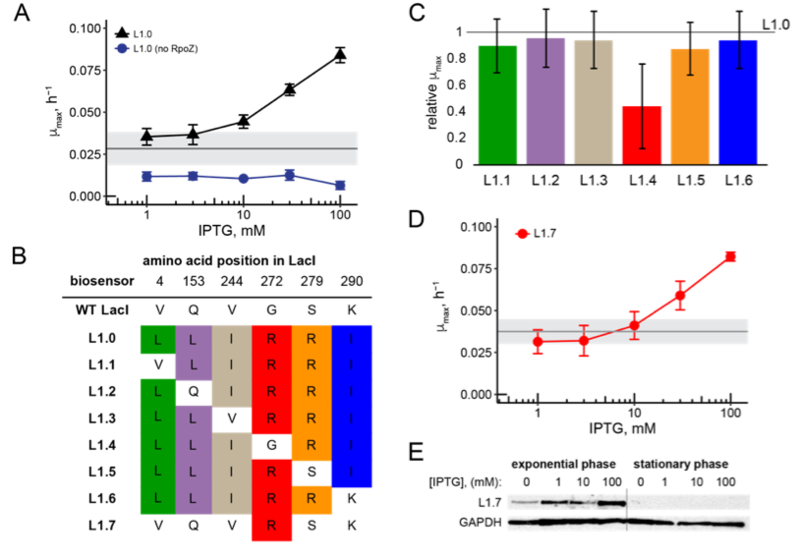 Efforts have primarily focused on changing the order of protein domains, substituting exogenous enzyme domains, and supplying unique extender substrates. However, technical challenges, such as poor interaction between non-native protein domains and reduced enzymatic activity, have stalled these efforts. I hope to overcome many of these challenges by using high-throughput DNA mutagenesis and biosensor-based selection to improve the activity of chimeric PKS enzymes. I have established that allosteric transcription factor MphR, which activates expression of a downstream gene in the presence of erythromycin, can be used for ligand-dependent expression of a HIS3 reporter gene. I plan to build a library of chimeric DEBS pathways with acyltransferase domains from other polyketide pathways (as shown in Figure 2), which control the substrates that are incorporated into the growing polyketide, and connect production of their macrolide ligand to the response of MphR. Figure 2. Strategy for constructing DEBS chimeras. Acyltransferase (AT) domains from several other polyketide biosynthetic pathways that incorporate different substrates into the polyketide natural product are swapped for the native AT domain, to generate a library of chimeric synthases. Finally, I will use multiplexed genome engineering in E. coli to introduce mutations near the substitute AT domain, and select for active pathway variants using the MphR biosensor to detect product formation (Figure 3). This strategy of high-throughput mutagenesis and biosensor-based selection could also be applied to other biosynthetic pathways that produce valuable small molecule or protein products. Figure 3. Biosensor-based strategy to improve biosynthetic pathway production. DEBS production is coupled to the MphR transcription factor, which in the presence of ligand, increases expression of the HIS3 and URA3 reporter genes required for growth in minimal media lacking histidine and uracil. After in vivo mutagenesis using DNA oligos, pathway variants able to produce the macrolide product will grow faster than those that produce no product or less product, such that after selection, active pathway variants make up a large fraction of the cell population. These will be scored by deep sequencing, to identify the best mutations, and subjected to additional rounds of mutagenesis and selection.